On April 1, Saudi-owned newspaper Asharq al-Awsat (the Middle East) published a cartoon which showed the Lebanese flag with the word “the Lebanese state” in the middle, and the title, April Fools (in Arabic it is “the lie of April”). Obviously, as most of you know, things have not been going well lately between Lebanon and Saudi Arabia. Saudi Arabia is angry with the Lebanese party, Hezbollah, who are embroiled in some serious trash talk with KSA. Saudi Arabia has retaliated by firing some Lebanese working there, freezing a grant for the Lebanese army (a grant, mind you, that we had been patiently waiting for to arrive for over two years), and among other things, publishing the cartoon depicted above. Now, just to be clear, I do not intend in any way to defend Saudi Arabia. I am not a fan of the regime over there, and not because I am Shia or a Christian and they are Sunni. No, I am not a fan of their regime because it is one more fundamentalist Arab dictatorship that breeds violence towards people who dare differ with the authorities and oppression towards women! That being said, I was rather angered by the reaction of many Lebanese people. Once the cartoon was published, there was a tremendous backlash on social media. Moreover, some Lebanese activists “raided” (seems like they have been playing a lot of Clash Royale lately) the offices of Asharq Al-Awsat and threw the papers covering the desks in the air (oooooh…dangerous). Thus our honour as Lebanese people was saved…NOT! Our wheat is cancerous, our electricity is non-existent, our rights to vote are stolen, our ministers are burglars, our internet is slow (that is the greatest sin of all), our women are half-citizens, our roads are jungles, our jungles are fading, and our greatest past-time as a nation is to smoke a pile of tobacco placed over a stick standing in a container of boiling water! Yet, we are angry and our emotions are moved by a caricature that dares insults our blessed country. Our honour is shamed and we must regain it by cursing Saudi Arabia on the internet. Then we can go and smoke Nargile in peace on the balcony while we breathe in the sweet smell of garbage in the state of Lebanon that is not a lie. Second, our reaction proved the cartoon right. If we have anything as a people, we have freedom of speech. Even that is being slowly snuffed out. If we have anything left to be proud of it is that we have theatre, novels, poetry, and journalism that are not afraid to say the truth. But you see, that is the funny thing about freedom of speech, it works both ways. You have freedom to speak, and then others have freedom to speak against you. Thus, Asharq Al-Awsat has the freedom to publish what they want against Lebanon. I found it funny that those activists who entered their offices to threaten them were held by the police a few months back as they demonstrated and tried to start a constructive revolution in this jungle of a country. They experienced oppression and someone shouting at them to shut-up. Now they are doing it to others. Who decides who can speak? Have we forgotten “Je suis Charlie?” Have we forgotten how journalists were gunned down in their offices for a mere drawing? Do we believe in the freedom of the press and the freedom of expression? Have we forgotten how Salah Mahdi Noureddine was attacked in Beirut when he raised a banner bearing a slogan accusing Nabih Berri, the head of Parliament, of corruption? The supporters of Berri threatened the man and beat him up simply because he had dared insult the god they worship. Do the Lebanese have honour? We have honour because we get out of our beds every morning, go through murderous traffic, work 2-3 jobs to pay the ever-increasing bills, and drop dead at night to sleep with the smell of garbage. We have honour because we have chosen to stay here and survive. We have honour when we refuse to bow down and worship the Lebanese militia leaders who fought during the civil war and have been ruling us ever since 1990. We have honour when we recycle our trash at home, in school, and at work. We have honour when we demonstrate and stand in the face of our corrupt politicians. We have honour when we refuse to believe that my party leader is always right and the rest are all liars. We have honour when we create art, excel in sports, stop at a red light, and share our houses with the refugees. But we have no honour when we shout out in anger against the simple truth found in a cartoon, a truth that is and should haunt us until things get better. We live in a country where order and wise leadership are a lie, and corruption and being ruled by war criminals is the truth. Face it. Do not get used to it. Fight it. Till we have a country? Assaad Thebian is one of the leaders of the You Stink movement that is organizing protests in Lebanon over corruption in general and the garbage crisis in particular. Recently, many articles have surfaced which accuse him of blaspheming against Christ and religion. Some prominent lawyers have raised lawsuits against him accusing him of blasphemy (yes, you can do this in Lebanon). 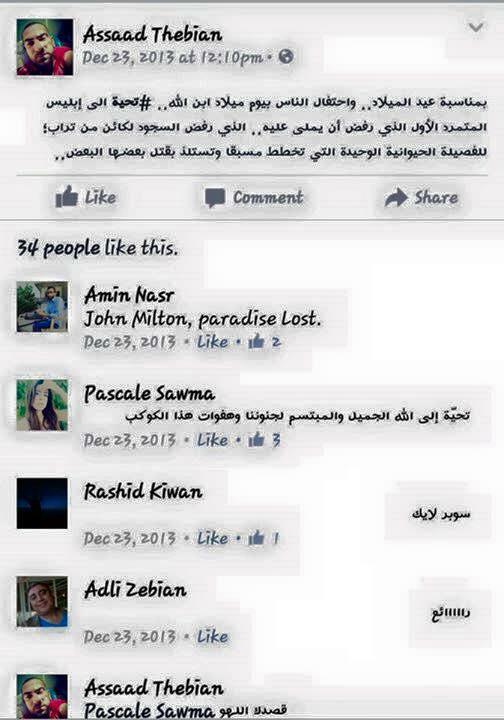 Many people have become angry with the whole movement because of the alleged blasphemy of Assaad Thebian. I decided to read these blasphemies of Assaad Thebian. I will post them here and briefly comment on each. Come, read them with me, and let us see whether Assaad blasphemed or not. Did Assaad Thebian blaspheme in this sentence? Not really. He called Jesus the son of God. Now the man wants to salute Satan as a rebel. That is not new. Much literature has been written on Satan as a rebel. Actually, his final comment on humans as being the only animals that take pleasure in killing each other is quite accurate. One of the luckiest characters in history is the criminal Barabas whom people chose to be set free in the place of Jesus. One of the most cursed (he used a slang Lebanese term which means the middle finger) characters in history is Joseph who married Mary, whom God impregnated and gave a son ..he did not have after him neither offspring nor a male child..although he raised up Jesus and protected him by escaping with him for decades..
To begin with, the guy does know the story. I suspect more than some Christians do. Secondly, he does hold a conservative Catholic view in Christianity and believes that Joseph did not have any children after Jesus. Thirdly, he is partly right, it was tough being Joseph. I wouldn’t have wanted to be in his place. Was his language polite? No. Did he blaspheme? He did not. You have to admit, this is a funny joke. Very inappropriate and dirty, yes, but funny. Let’s be honest here, he is right. We have turned the festival which remembers the death and resurrection of Jesus into a festival of bunnies, eggs, and other silly stuff. We have brought this on ourselves. Again, I do not see any blasphemy here. This guy seems more powerful than Jesus and God by far. He does not believe that St. Charbel is performing miracles. Last time I checked, that was not blasphemy against God. If anything, he is telling people: you are placing St. Charbel above Jesus and God. I would agree with him on that. Yes, some Christians tend to worship St. Charbel above their worship to God. 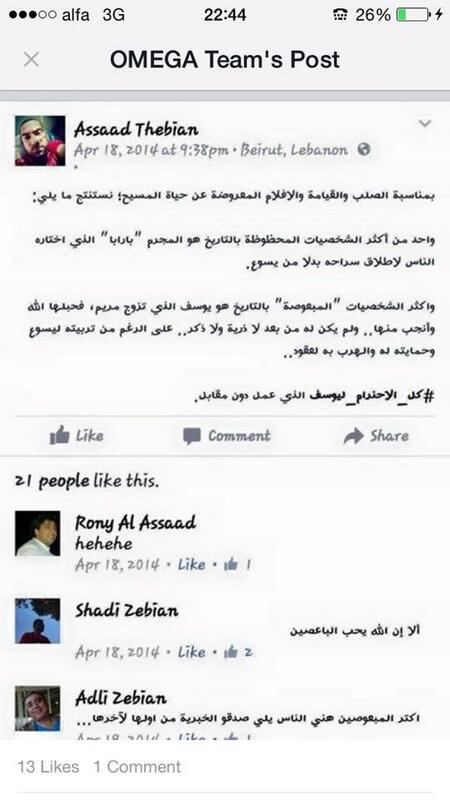 So, there it is: Assaad Thebian did not blaspheme. He is not exactly very respectful of religion. But, do you know something, he is not forced to! I, Nabil Habiby, respect religion, believe in God, and follow Christ. But that’s me. I cannot force others to think like me. I tell others about Jesus. I try to live and love everyone like Jesus. But I can’t force people to think like me. This Lebanese revolution is about giving people, people and not religions, their rights. All people – Muslims, Christians, Jews, Atheists – deserve to live in a dignified manner. 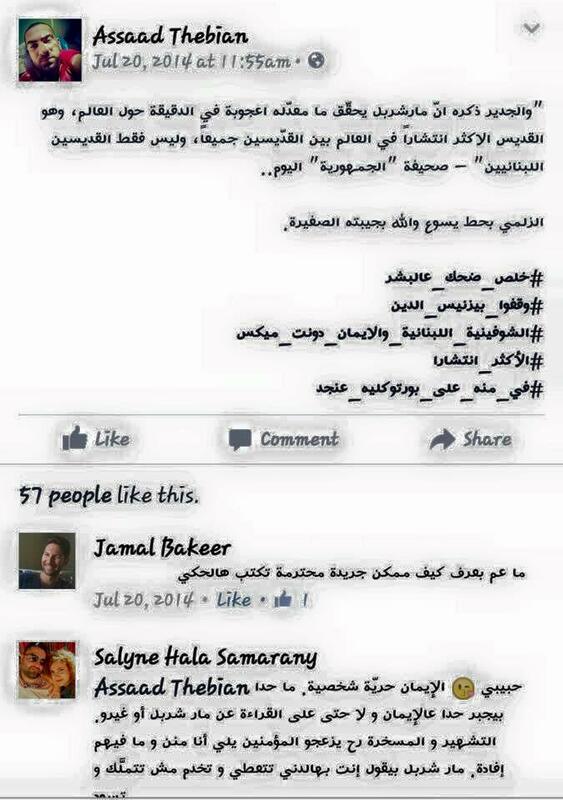 Assaad Thebian did not blaspheme. However, even if he did, so what? I, for one, will walk beside him in the streets and call out for dignity, freedom, and respect to all people. This is what my God whom I follow calls me to do. To all those believers in God who were offended by the words of Assaad Thebian, how come you are not offended by our leaders who claim they know God but walk in evil and steal from the poor? I have a feeling that perhaps if believers in God truly walked like God more people would take religion seriously. Do you want to defend God? Then live in obedience to him. Do you want to show a good picture of God? Then love others. Do you want to be a follower of God? Then start with yourself, and leave the rest to him. And forget to love you. In the past weeks the Lebanese people have taken to the streets to protest against our corrupt regime. Many followers of Jesus, including myself, have joined the demonstrations. However, a number of people in the church claim that the Bible asks followers of Jesus not to protest against the government. The passage most frequently used is chapter 13 of Paul’s letter to the church in Rome. So, the question is, does Romans 13:1-7 ban Jesus-followers from protesting against the government? I am aware that for many of my readers this question is not important. However, for many others, the Bible is important, and they would like to obey it. So, if you do not care about the Bible, please bear with me in this post. 13 (1) Let every person be subject to the governing authorities. For there is no authority except from God, and those that exist have been instituted by God. (2) Therefore whoever resists the authorities resists what God has appointed, and those who resist will incur judgment. (3) For rulers are not a terror to good conduct, but to bad. Would you have no fear of the one who is in authority? Then do what is good, and you will receive his approval, (4) for he is God’s servant for your good. But if you do wrong, be afraid, for he does not bear the sword in vain. For he is the servant of God, an avenger who carries out God’s wrath on the wrongdoer. (5) Therefore one must be in subjection, not only to avoid God’s wrath but also for the sake of conscience. (6) For because of this you also pay taxes, for the authorities are ministers of God, attending to this very thing. (7) Pay to all what is owed to them: taxes to whom taxes are owed, revenue to whom revenue is owed, respect to whom respect is owed, honor to whom honor is owed. The specific context of the passage is 12:1 – 15:13. Here, Paul is giving practical advice to his listeners about how to live in love. In chapter 12 he speaks of love and in 13 he applies this love to government. Romans 13 calls Jesus-followers to be good citizens. Note that in 12: 19 Paul is against revenge and in 13 he says that the government will punish the wicked. Thus, in its context, our passage is reminding the church that love is shown to fellow believers, enemies, and the rulers. Caesar was a political and religious leader. People had to pay him taxes and pray for him. Being a follower of Jesus, of God’s kingdom, meant not participating in public worship of Caesar. Paul constantly speaks of submitting to others (Ephesians 5:21) not out of fear but because we submit to God. It is not forced submission but out of love. God appoints rulers so God is the ultimate ruler and not the authorities. Ultimate submission is to God. God is to be obeyed more than earthly authorities. Thus, when Paul says that the rulers are assigned by God, he is placing God above the earthly empire of Rome. Interestingly, the rulers (13:6) are serving God. Paul does not have different languages for politics and religion like we do. Everything can be viewed through the lens of God. These pagan rulers, without them knowing it, are actually servants of God. In the Kingdom of God, God is king. C. But Paul, what if the rulers are not behaving in a just way? In conclusion, God is in charge even if we do not always see his hand. We wait and trust in him. Jesus-followers are citizens of two worlds: earth and heave at the same time. Our submission to authorities is limited because our ultimate submission is to God. But, our disobedience must be in love, for we do not fight evil by evil but by love. Our one calling is love. What is the answer then: Can followers of Jesus protest against the government? I do not think Paul is saying no in Romans 13:1-7. If we who follow a just and loving God, and look and see our governments behaving in oppression against the poor, then we should be the voice of God, reminding them that they should be behaving in justice and not evil. Bonheoffer stood up against his ruler Hitler, because he knew that his God hates the murder of the innocent. Martin Luther King Jr. stood up against the racist system of his day, because he knew that his God does not differentiate between black and white. Tomorrow and in the coming weeks, let us stand up against our government because we follow a God who hates corruption and loves justice, who hates oppression and loves mercy. In the coming weeks, in our actions at home and on the streets, let us declare that our God is king. * Most of the ideas in this blog are taken from a paper entitled “Holiness and Politics in Romans 13:1-7” by my good friend Gift Mtukwa. He presented this paper in a module we were taking together for our MA on holiness in Paul’s writings. 1 لتخضع كل نفس للسلاطين الفائقة، لانه ليس سلطان الا من الله، والسلاطين الكائنة هي مرتبة من الله، 2 حتى ان من يقاوم السلطان يقاوم ترتيب الله، والمقاومون سياخذون لانفسهم دينونة. 3 فان الحكام ليسوا خوفا للاعمال الصالحة بل للشريرة. افتريد ان لا تخاف السلطان؟ افعل الصلاح فيكون لك مدح منه، 4 لانه خادم الله للصلاح! ولكن ان فعلت الشر فخف، لانه لا يحمل السيف عبثا، اذ هو خادم الله، منتقم للغضب من الذي يفعل الشر. 5 لذلك يلزم ان يخضع له، ليس بسبب الغضب فقط، بل ايضا بسبب الضمير. 6 فانكم لاجل هذا توفون الجزية ايضا، اذ هم خدام الله مواظبون على ذلك بعينه. 7 فاعطوا الجميع حقوقهم: الجزية لمن له الجزية. الجباية لمن له الجباية. والخوف لمن له الخوف. والاكرام لمن له الاكرام.